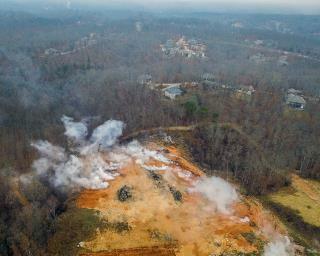 (Newser) – More than seven months after residents first noticed a fire at an illegal dumping site in northwest Arkansas, it's still smoldering, sending noxious smoke throughout the town and seeping into homes, with costs to extinguish the fire estimated at tens of millions of dollars. Chris Nelson, 40, lives with his wife and 4-year-old son in a house that's a little more than 1,000 feet from the shuttered dumping site. He says his family has experienced a persistent cough since the blaze started, his wife has been diagnosed with bronchitis, and his son has been on multiple rounds of antibiotics. "I'm a veteran and this is probably one of the worst, most stressful situations to live in," Nelson says. "It's been hell." 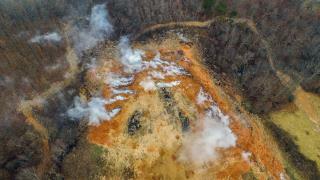 State officials say the site should never have been used as a dump of any kind, especially not for non-organic items like car batteries and swimming pool liners. 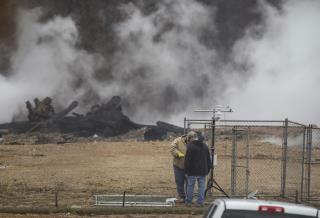 The fire burning at least 70 feet underground in this community of about 28,500 people some 170 miles northwest of Little Rock has raised questions about how and why the dump operated without a state license for several years, the AP reports. The exact cost to put out the fire and get rid of the waste is unknown. 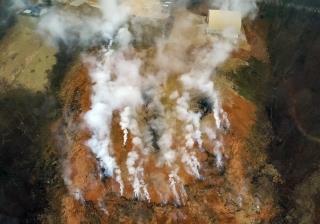 Arkansas Department of Environmental Quality spokeswoman Donnally Davis says estimates so far have ranged from $15 million to $37 million. 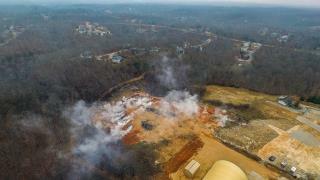 She says air pockets and vents are interspersed between layers of dumped material, meaning extinguishing the blaze will be more complicated than just dumping water on it. State lawmakers are considering a $20 million appropriation to help. Sounds like a Federal emergency needs to be declared for this. An entire town can't be left to suffer. I thought it was an article about the DNC since President Trump won the election.